German astronomers tracked the movement of 28 stars circling the centre of the Milky Way, using two telescopes in Chile. 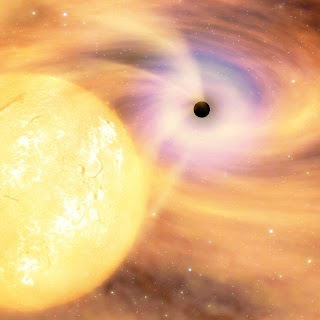 Black holes are objects whose gravity is so great that nothing - including light - can escape them. Dr Massey said: "Although we think of black holes as somehow threatening, in the sense that if you get too close to one you are in trouble, they may have had a role in helping galaxies to form - not just our own, but all galaxies. "They had a role in bringing matter together and if you had a high enough density of matter then you have the conditions in which stars could form. "Thus the first generation of stars and galaxies could have come into existence". The researchers from the Max Planck Institute for Extraterrestrial Physics in Germany said the black hole was 27,000 light years, or 158 thousand, million, million miles from the Earth. "Undoubtedly the most spectacular aspect of our 16-year study, is that it has delivered what is now considered to be the best empirical evidence that super-massive black holes do really exist," said Professor Reinhard Genzel, head of the research team. "The stellar orbits in the galactic centre show that the central mass concentration of four million solar masses must be a black hole, beyond any reasonable doubt."